It is a time for New Year’s Resolutions and making positive changes in our lives. The calendar New Year is a common time for making resolutions. Here is my resolution, that I make frequently – committing to spend more time on the site and taking care of the Church and School of Wicca’s activities. I ask you to keep me honest to ensure that I am spending at least an hour a week with you (reducing a backlog of mail and inquiries). We are facing a calendar change into a New Year. First things first, New Year’s Resolutions: how can you make the most effective resolution? For one thing, January 1 is a full moon in Cancer, a time for setting the home fires straight as Cancer energy is all about home. The Moon is naturally ruled by Cancer (or vice versa)—it’s time to feel at home, quietly ensconced in security and peace and quiet. Your resolutions will have a better opportunity for success if they relate to home and security, first of all. The second notion for a successful resolution is that if you are making a resolution on the full moon, the moon is at its largest during the moon cycle. Therefore, you would want to make a resolution that suggests decreasing something. Instead of a New Year’s Resolution that is about increasing your exercise regime, you would want to create a resolution that reduces poor health. What is the best resolution for you? What is the best way to take advantage of the energy of the spheres? Take some time to meditate on what the best resolution is for you. Light a candle that has the scent or color of home or play some music that is comforting, and meditate on a way to reduce a lack of security at home. Remember to protect yourself for meditation, saying “I am surrounded by the pure white light of the God/ess. Nothing but good will go from me, nothing but good will come to me.” Query within your meditation a way to improve security at home through reducing conflict at home or improving family relationships through reducing distractions. The best part of January 2018? It’s a blue moon month. My eldest son came just a few days after a blue moon, so I feel real joy when we have these rare occurrences. I hope that you find ways to experience joy during our long nights of winter in this Northern Hemisphere. Yvonne is doing well – healthier and happier. She had a physical event in October that was her wake-up call that kind of making an effort towards being healthy was not enough. She is seriously considering making a real change to a Whole Foods Plant Based Diet that she and Gavin talked about frequently before Gavin crossed over. They loved T. Colin Campbell’s book The China Study and gave away copy after copy. Now, Yvonne, after watching “Forks Over Knives”, “What the Health” and “In Defense of Food” on our snowy days off is really thinking through giving up her daily egg, which is a comfort food, and re-examining her diet. 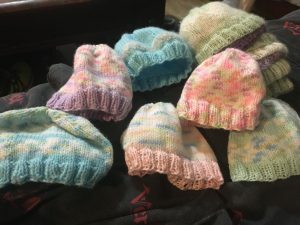 At her age, one of the best terms of advice we can give her is Pollan’s requote from Oscar Wilde, “Everything in moderation, including moderation.” She knits, works out daily, and goes to a community center every work day. She is healthier and happier every day, which is such a blessing. And remember, what we are learning is not intended to be a substitute for professional medical advice, diagnosis, or treatment. Always seek the advice of your physician or other qualified health provider with any questions you may have regarding a medical condition. What we are doing at home is trying to help Yvonne take her good ideas about health that she accumulated over the years from reading and unsound medical advice from a local doctor. I’m hoping that as we move forward on this journey for her health, that we find a way for her to truly understand what healthy eating and living really means for her so she can live her best life. Seeing pictures of women older than her exercising more than she does really got her attention. Someday, we will revamp the Healing course to reflect our better knowledge and understanding of health. We become so much smarter every day about our health. Blessed be in the New Year: we welcome all who Seek.